Getting past ‘I don’t know’ matters. If we can’t get students’ ideas out into the open – if we can’t help them to verbalise the thoughts whizzing about in their minds – then we can’t help them to think better, more deeply and more creatively. As teachers, we need access to students’ thinking. It’s through this access that we can diagnose the current position of their knowledge and understanding. It’s through this that we can critically assess how they are thinking and why they are thinking in that way. And it’s through this that we can cultivate a classroom discourse that focuses on exploration and development. Without access to students’ thinking we can’t identify and teach away from mistakes and misconceptions. And it becomes much harder to pose questions closely matched to student needs. 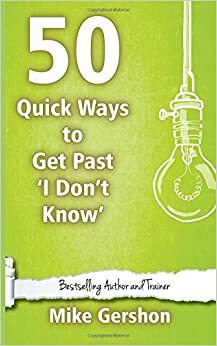 50 Quick Ways to Get Past 'I Don't Know' presents you with all the practical strategies you need to support your learners and help them successfully articulate their thoughts and take part in discussions. This book will help you to ensure that learning takes centre stage every time you ask a question or set a discussion activity in your lessons. It shows you what you need to do to turn 'I don't know' into a starting point for learning - as well as how to avoid the response in the first place. Each entry is explained and exemplified, showing how you can make it part of your practice. And you can use all the strategies, activities and techniques across the curriculum and with a range of different age groups.